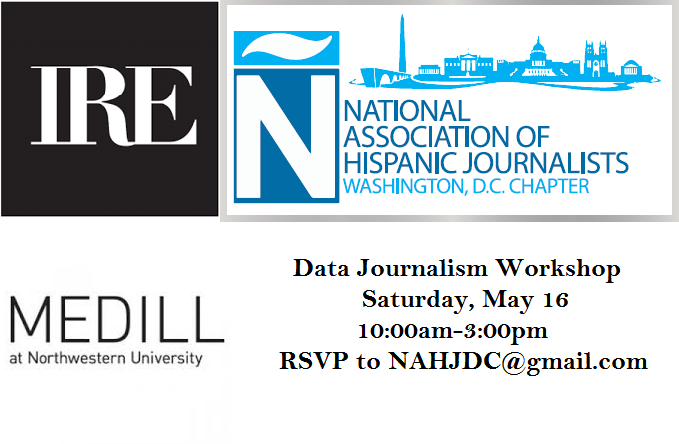 Join NAHJDC, IRE-DC and the Medill journalism school for a one-day intensive data workshop with a special focus on census data on Saturday, May 16 from 10:00am-3:00pm. In four classes, our instructors will teach you the essential skills you need to analyze the data and identify possible news stories. This workshop is ideal for people with little to no experience with data journalism. The event will be hosted at the Medill Washington D.C. newsroom, located at 1325 G Street NW, #730. Registration fee is $15. Lunch and refreshments will be served. Please plan to bring your laptops. Register by RSVPing to nahjdc@gmail.com. Space is limited. 2:30pm-3:00pm Conclusion—Data journalism beyond excel: What is possible with database programs?